Bone broth is popping up as an ingredient in a lot of recipes lately, isn’t it? You may feel the urge to substitute store-bought broth for homemade bone broth, as it’s one of those ingredients you may not want to take the time to make. I completely understand, but I have to tell you, you’re missing out! Homemade bone broth is amazing and I assure you that it’s easier to make than you think. Bone broth is simply the bones from animals that are slow simmered for hours to bring out exceptional taste and nutrition. Popularized by traditional diets like those encouraged by the Weston A Price Foundation, bone broth can be used in moderation by anyone wanting to add awesome nutritional value to their diet. Try poaching eggs in bone broth once a week. Or add it to soups or stews, a great way to boost the nutritional value of comfort foods. 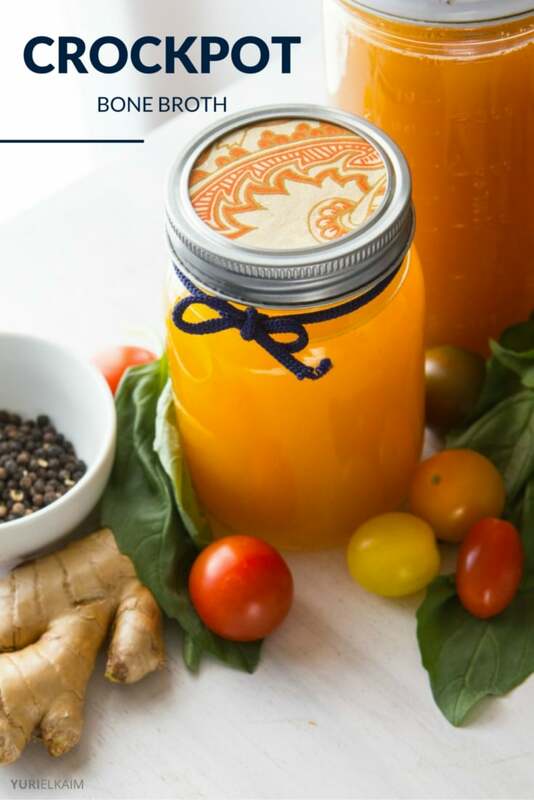 Having a freezer full of homemade bone broth allows you to use small amounts of this highly nutritious product whenever you want to add more oomph to your eating. What’s so great about homemade bone broth? Aside from its rich depth of flavor, bone broth is incredibly healthy. It’s high in protein, chock full of collagen and is a great source of essential minerals like calcium, magnesium, and phosphorus. Bone broth contains glycine, an amino acid used to make protein, and is the primary component of connective tissue. In addition, glycine supports digestion and the body’s natural detoxification process. Properly made broth is also rich in gelatin, which is a good, inexpensive form of protein. Gelatin may also have protective effects against degenerative joint disease, and helps to support the connective tissue in the body. If you want even more gelatin in your broth, ask your local poultry farmer for the feet and heads from pastured chickens, since they add even more nutritious, healing gelatin to the broth. As you may know, I’m a major advocate of an alkaline, 80% plant-based diet, so you’re probably wondering where I stand on the issue of utilizing animal bones (which can be highly acidic) when making broth. Since I supplement my plant-based eating with occasional animal products (remember, that other 20% of your diet is for “eating whatever you want”! ), I love the nutritional benefits that come with intermittent bone broth consumption. Though animal products typically fall on the “acidic” side of the pH spectrum, collagen is actually an effective inflammation fighter, so it’s worth getting some of it into your diet. Of course, if the very idea of eating animal products turns your stomach, there are other ways to add similar nutrients into your week with easy-to-consume vegan homemade broth. Seaweed and other fermented veggies can be powerful sources of must-have essential nutrients. 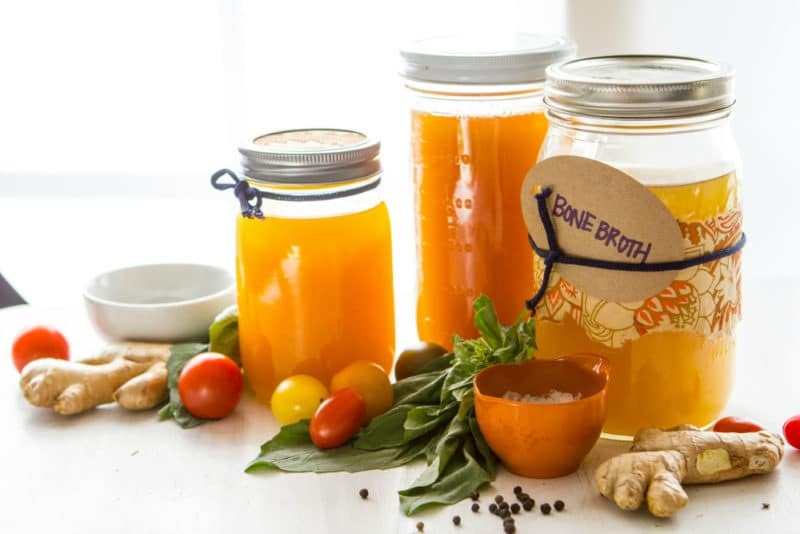 If you’d prefer a vegan option, try this Vegan Bone Broth recipe from Organic Authority. Creating a good stock starts with good ingredients. You’ll want to select high-quality bones from grass-fed livestock, pasture-raised poultry, and wild-caught fish. Look for bags of these items in the freezer section of most natural food stores. I’ve also found Asian grocers to be a great source. To give your broth an umami flavor, you can also add in wild mushrooms or sea vegetables while simmering. Though your broth will simmer and start smelling aromatic after just an hour of cooking, avoid the temptation to take it off the stove! You need to cook the bones for hours to fully release all of the gelatin from the bones. Stick to the recipe and you’ll see awesome results! If using your bone broth within 4 days, store it in the fridge. You can make a big batch of bone broth and freeze it for later use. It will keep in the freezer for up to 6 months. Here’s how to freeze it: after it cools, pour into freezer-safe mason jars, any other freezer-safe containers, or ice cube trays. Make sure to leave 1½ -2 inches at the top of each container due to liquid expansion as it freezes. To reheat frozen bone broth, remove the lid and warm in a waterbath or microwave until steaming. For bone broth ice cubes, simply pop a few squares out and toss in a pot of simmering soup or stew. There are so many ways to enjoy homemade bone broth. One of the simplest is to heat it and drink like a mug of tea. Add salt, pepper, and crushed garlic for a wonderful, warm drink. You can use bone broth in any recipe that calls for chicken or beef stock, such as soups or stews. Bone broth adds a rich flavor to braised and roasted meats, as well as braised vegetables. It really doesn't take much prep time to make this exceptionally tasty and nutritious bone broth. 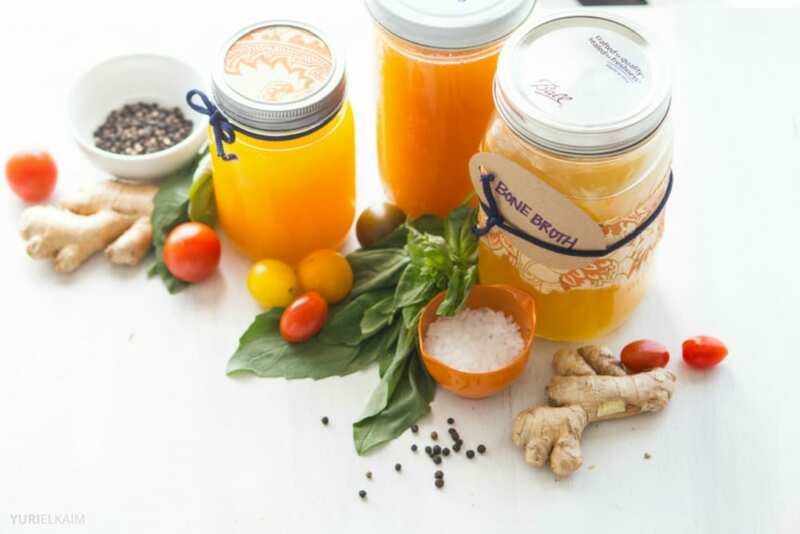 Once you make this homemade broth, you'll never buy store-bought again! Place all ingredients in a 5­-7 quart slow cooker. Fill with enough water to completely immerse. Cover and cook for 12 hours on low. 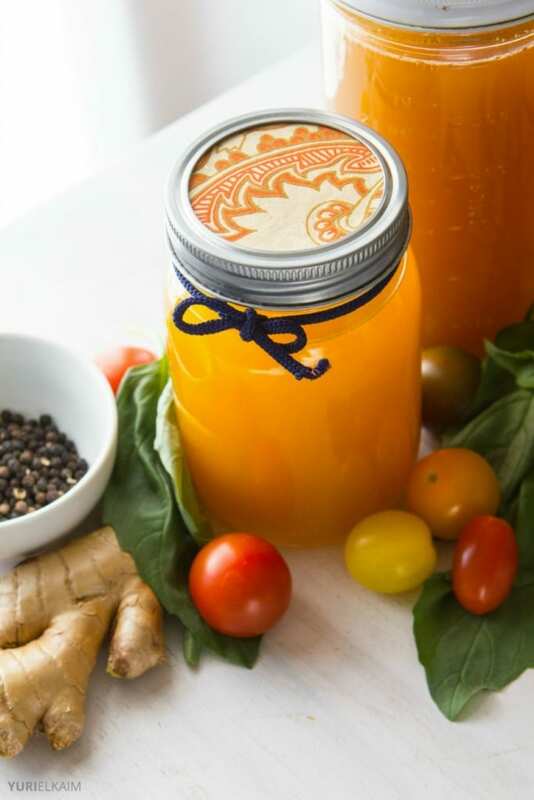 Remove large bones with tongs, and pour the broth through a slotted spoon into freezer-safe containers or mason jars. Cool and freeze what you don't plan to use within 4 days. Enjoy! Frozen bone broth will last up to 6 months in the freezer.